Litchfield is a town in Hillsborough County, New Hampshire, United States. The population was 8,271 at the 2010 census, with an estimated population in 2017 of 8,502. Prior to European settlement, the area was populated by the Abenaki. They were skilled with fishing and were adept in agriculture as well. The New Hampshire Archaeological Society has located over 30 Native American sites along the shore of the Merrimack River in Litchfield, with artifacts several thousands of years old being uncovered. Most of Litchfield was part of the large town known as Dunstable, which was organized in the 1600s and included land along both sides of the disputed New Hampshire-Massachusetts boundary, and out of which were carved several towns and cities in both states. The area which became Litchfield was originally known as "Naticook". In 1656, William Brenton was granted land which included much of present-day Litchfield. The name was changed to "Brenton's Farm" in 1729, after William Brenton, colonial governor of Rhode Island. The town was first incorporated into Massachusetts on July 4, 1734. The first town meeting was held on Monday, July 29, 1734, at 1 pm at the house of Aquila Underwood to choose town officers. After Brenton's death in 1749, the land was granted to another group of settlers and named "Litchfield" after George Henry Lee, Earl of Lichfield. Litchfield was incorporated into the Province of New Hampshire on June 5, 1749. Wiseman Claget moved to his substantial estates here shortly before the Revolution. He was involved in the temporary government serving as the only Solicitor General, the post being abolished shortly before his death in 1784. Litchfield lacks any major population center or central village. Historically farmland, the town featured steep population growth starting in the 1970s along with the rest of southern New Hampshire as a bedroom community and exurb for Greater Boston. The original town hall was located along NH 3A in the east-central portion of the town; the current town hall lies at the town's geographic center at the intersection of Hillcrest Road and Albuquerque Avenue. There are no large commercial districts in the town, though a few small industrial parks, convenience stores, and small restaurants dot the landscape. According to the United States Census Bureau, the town has a total area of 15.4 square miles (40 km2), of which 15.1 sq mi (39 km2) is land and 0.3 sq mi (0.78 km2) is water, comprising 2.27% of the town. The highest point in Litchfield is the summit of Rocky Hill, located in the Litchfield State Forest, at 357 feet (109 m) above sea level. 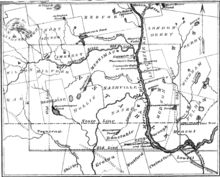 The town is bordered to the north by Manchester, to the east by Londonderry in Rockingham County, to the south by Hudson, to the west by Merrimack, and to the extreme southwest by Nashua, with the Merrimack River separating Litchfield from both Merrimack and Nashua. There is no bridge connecting Litchfield and Merrimack; the closest river crossings are to the south between Nashua and Hudson, and to the north between Manchester and Bedford. There are two islands in the Merrimack River within the borders of Litchfield. The islands have been called "Minnewawa" and "Nunnehaha", the Naticook Islands, and Reed's Islands. The northern island is located within Litchfield, while the southern island is essentially split down the middle by the boundary between Litchfield and Merrimack, forming the only land border between the two towns. Merrimack owns both islands. As of the census of 2000, there were 7,360 people, 2,357 households, and 2,031 families residing in the town. The population density was 487.5 people per square mile (188.2/km²). There were 2,389 housing units at an average density of 158.3 per square mile (61.1/km²). The racial makeup of the town was 97.72% White, 0.53% African American, 0.29% Native American, 0.57% Asian, 0.15% from other races, and 0.75% from two or more races. Hispanic or Latino of any race were 0.83% of the population. There were 2,357 households out of which 53.4% had children under the age of 18 living with them, 75.3% were married couples living together, 7.4% had a female householder with no husband present, and 13.8% were non-families. 9.5% of all households were made up of individuals and 1.4% had someone living alone who was 65 years of age or older. The average household size was 3.12 and the average family size was 3.35. In the town, the population was spread out with 33.4% under the age of 18, 5.4% from 18 to 24, 37.8% from 25 to 44, 19.9% from 45 to 64, and 3.5% who were 65 years of age or older. The median age was 33 years. For every 100 females, there were 101.1 males. For every 100 females age 18 and over, there were 98.1 males. The median income for a household in the town was $73,302, and the median income for a family was $76,931. Males had a median income of $46,809 versus $33,488 for females. The per capita income for the town was $25,203. About 2.2% of families and 2.1% of the population were below the poverty line, including 1.6% of those under age 18 and 12.1% of those age 65 or over. New Hampshire Route 3A closely parallels the Merrimack River, entering the town from Hudson in the south, and leaving the town into Manchester in the north. It is known as the Charles Bancroft Highway through the town. New Hampshire Route 102 crosses the extreme southeastern corner of town, known as Derry Road locally. It enters Hudson at both borders. Though the town borders Merrimack on the west, it cannot be directly accessed as there are no bridges across the river. Access to Londonderry, to the east of Litchfield, is primarily via Hillcrest Road, which is the main east-west thoroughfare across central Litchfield. Litchfield has no air or rail transport within the town limits. The nearest commercial airport is Manchester–Boston Regional Airport along the border of Londonderry and Manchester, which is close to the northern border of Litchfield. The nearest rail service is the Lowell Line of the MBTA Commuter Rail which can be accessed at the Charles A. Gallagher Transit Terminal in Lowell, Massachusetts. The nearest Amtrak stations are Boston's North Station or South Station. There was a trolley that ran through Litchfield in the early 20th century. The trolley has long since been discontinued and fallen into disrepair. There are few remnants left, including a portion of rail trail and a dilapidated trolley bridge within Parker Park. The town of Litchfield operates a waste management and transfer station on Hillcrest Road, located near the geographical center of Litchfield and the "new" town hall and police station. The historical center of Litchfield is on the Charles Bancroft Highway (New Hampshire Route 3A). Today the fire station, the first church in Litchfield, the Litchfield Community Television studio, and the Litchfield Historical Society are located there in and around the old town hall. A new fire station is currently under construction next to the current town hall and police station, after gaining approval in the 2018 town meeting. Several public parks, including Roy Memorial Park and the Litchfield State Forest, are open year-round to the public. Municipal parks are managed by the Litchfield Recreation Commission. The state forest is managed by the New Hampshire Department of Natural and Cultural Resources, among other agencies. The Litchfield Mosquito Control District was featured on Last Week Tonight with John Oliver. The episode featured segments from a televised town meeting from September 17, 2015, which had no members of the public in attendance. The town has several conservation areas, including Moore's Falls, Parker Park, and Stage Crossing. The Litchfield Conservation Commission holds the responsibility of managing these lands for the preservation and proper utilization of natural resources in town. The conservation commission established four trails in August 2018 on the roughly 84 acre Birch Street property, which was purchased in 2015. This property has also been informally called "Fallen Birch Conservation Area." ^ a b "Annual Estimates of the Resident Population for Minor Civil Divisions: New Hampshire: April 1, 2010 to July 1, 2017". U.S. Census Bureau. Retrieved November 13, 2018. ^ Fox, Charles J. (Charles James) (1846). History of the old township of Dunstable: including Nashua, Nashville, Hollis, Hudson, Litchfield, and Merrimac, N.H.; Dunstable and Tyngsborough, Mass. The Library of Congress. Nashua, C. T. Gill. ^ "Chapter VII: Historic Resources" (PDF). Town of Litchfield Master Plan. 2002. Retrieved May 14, 2018. ^ Fox, Charles J. (Charles James) (1846). History of the old township of Dunstable : including Nashua, Nashville, Hollis, Hudson, Litchfield, and Merrimac, N.H. ; Dunstable and Tyngsborough, Mass. The Library of Congress. Nashua, C. T. Gill. ^ a b Hurd, D. Hamilton. History of Hillsborough County, New Hampshire. The University of Chicago Libraries. J.W. Lewis & Co. pp. 490–491. ^ Hurd, Duane Hamilton (1885). History of Hillsborough County, New Hampshire. J. W. Lewis & Company. ^ "A Brief History of Merrimack, New Hampshire". Merrimack Historical Society. Retrieved November 5, 2018. ^ "The Lower Merrimack River" (PDF). NH Department of Environmental Services. 2016. Retrieved November 5, 2018. ^ a b "NRPC GIS Map". Nashua Regional Planning Commission. Retrieved November 5, 2018. ^ "Proposed Litchfield Fire Station". Retrieved September 16, 2018. ^ John Oliver (March 6, 2016). Special Districts: Last Week Tonight with John Oliver (HBO) (Video) (YouTube). New York: HBO. Event occurs at 4:06. Retrieved June 4, 2017. ^ Mosquito Control District Meeting - Sept 17, 2015 (Video) (YouTube). Litchfield, New Hampshire: LitchfieldTV. September 17, 2015. Retrieved June 4, 2017. ^ "CLAGETT, Clifton, (1762 - 1829)". Biographical Directory of the United States Congress. Retrieved January 19, 2014. ^ "Spotlight On...Jennifer Simard". www.theaterinthenow.com. Retrieved 2018-10-21. ^ Waller, John (March 18, 2018). "Why I'm Running: Caitlyn Callinan is running Boston on her 18th birthday to honor her grandfather". Boston.com. Retrieved October 29, 2018. Wikimedia Commons has media related to Litchfield, New Hampshire.